The thought of your children getting behind the wheel of a two-ton car is scary, but as a parent, it’s your job to protect them with the right car insurance and to teach them how to drive safely. While preparing yourself for the end of their learner’s permit, there are a few pieces of advice that you should share while you’re still in the passenger seat. Though you may hope that your teen won’t turn into an aggressive driver, children at that age often feel invincible and want to impress their friends. Try to lead by example by stopping at yellow lights, staying within the speed limit, and refraining from tailgating. You can also show your child news articles about road rage incidents that ended badly. Teens revel in the freedom that driving provides, but they should be reminded that they aren’t actually adults yet. Your teen still needs to follow your rules, and driving isn’t something that he or she has a right to. If your child gets into trouble at school, behind the wheel, or otherwise, you can still take away the car keys as punishment. You might not want your child to be out drinking with friends, but it could happen. Stress that if your teen ever gets drunk, he or she is to call you for a ride home. Not only will it prevent your child from getting into an accident, California has a strict zero-tolerance law when it comes to teens drinking and driving. 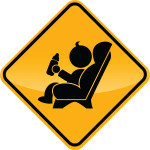 Violations can affect your child’s driving record more than he or she may realize. Kids typically need to learn some lessons the hard way before advice sinks in, but one lesson they should never have to learn is the fallout of recovering from an accident without proper car insurance. If your child is on your family’s insurance policy, make sure you keep it up to date. If your child isn’t on your policy, help him or her get quotes for coverage and explain what different types of coverage actually cover. Getting your child started on the right foot when it comes to driving is something that you should take the time to do. If you’d like to share more driving tips with your child, the California DMV offers a Parent-Teen Training Guide. When looking for the right insurance for your teen driver, be sure to get competitive car insurance quotes, so you find the best option.